Our firm has a database with the information of all the Trademarks published in the Argentina; for this reason searches are performed very quickly. Before filing a trademark application, it is suitable to detect whether there are antecedents of other trademarks that can be opposable. In GATTI this first assessment is free of charge as part of our advice prior to the registration of the trademark. Products and/or services are grouped according to a common feature based on its utility or use. This is how trademarks are classified according to an international nomenclature that contains 45 different kinds of classes in which 34 correspond to products and 11 to services. In accordance with the trademark law 22.362 and except in very exceptional cases, the only way to get an exclusive right on a distinctive mark or brand is to obtain a valid registration before INPI. It is the best way to protect products or services against counterfeiting and unfair competition. Once the trademark is incorporated in our digital files, it will be guarded to detect possible antecedents that are published and likely to impair the distinctive strength of your trademark, resulting in the decrease of its value. In these cases, you must present opposition to the new detected trademark and thus to enforce our rights. Included in our digital database, we proceed to its surveillance for over the 10 years of its validity and notice is given promptly to its corresponding renewal for a further identical period. 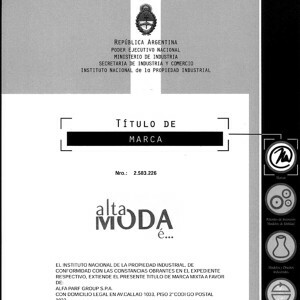 After the presentation is carried out the publication in the Official Bulletin of Trademarks. From this point, there is a period of approximately 30 days in which a third party can file an opposition to the new filling presentation. In this stage of proceedings our professionals can advise you, guide you and define the actions giving the best response to implement and obtain a favorable process . If all these stages are concluded effectively, the INPI emits the corresponding title that certifies that the trademark has been granted. The procedure lasts 17 months approximately, provided that it did not receive any notification by oppositions and/or antecedents. The validity of the registration is 10 years throughout the Argentine territory.